If life after work means more than a beach chair, the best place to retire might be the big city. We looked at 30 of the nation's largest metro areas and found the right neighborhoods for you. Real estate: A two-bedroom in a new building will cost $350,000 and up. A rental will cost about $1,600 a month or more. The neighborhoods of Hillsboro and Midtown offer the best of Music City. Bordered by Vanderbilt University and Music Row, the area is filled with students and professionals alike. There's ample opportunity to walk through Vanderbilt's campus, nearby Centennial Park or down 21st Avenue South, which teems with local boutiques, cafes and restaurants. 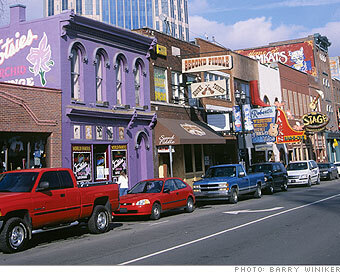 Nashville's downtown is a quick cab- or car-ride to the east. There, you can get your fill of all things music, from performances at the Schermerhorn Symphony Center to dancing at honky-tonks. In Hillsboro and Midtown, new condominiums are sprouting up. With high-end amenities such as pools and outdoor kitchens on communal decks, "some developments are catering to more of an older demographic," says Ryan Michaels, a realtor at Village Real Estate and founder of urbanlivingnashville.com. Several hospitals are right around the corner, including Baptist Hospital and the Vanderbilt Medical Center.